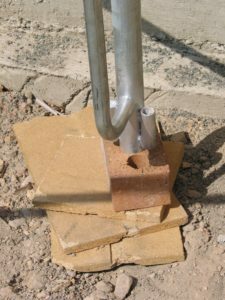 If scrap material (eg bricks, timbers, tiles, etc) is used as a foundation there is a high risk of the foundation collapsing which may cause the scaffold to overturn or collapse. Instead, baseplates and soleboards that meet AS/NZS 4576 should be used. Always make sure that the baseplates are centrally supported on the soleboards. Not being centered risks the baseplate slipping off the soleboard leading to skewing of the scaffold or even possibly having the scaffold collapse. 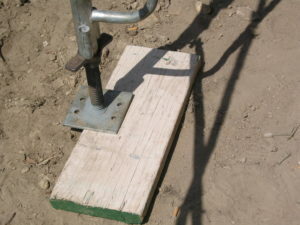 Never have the soleboards of a scaffold straddle a trench or excavated area, nor should a scaffold be erected too close to a trench or excavation. 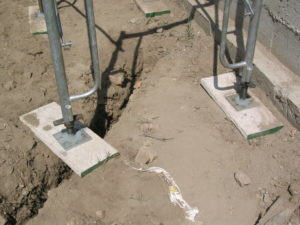 The risk of subsidence or collapse of the excavated are or trench leads to uneven point loads or even having the scaffold fall into the trench. Always make sure that the soleboards are bedded in a firm foundation and the distance from the scaffold to a trench should be no less than the depth of the trench or excavation.